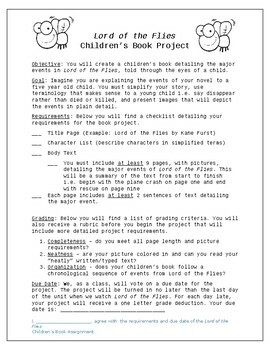 Objective: You will create a children’s book detailing the major events in Lord of the Flies, told through the eyes of a child. Goal: Imagine you are explaining the events of your novel to a five year old child. You must simplify your story, use terminology that makes sense to a young child i.e. say disappear rather than died or killed, and present images that will depict the events in plain detail. Requirements: Below you will find a checklist detailing your requirements for the book project.